Uganda, officially the Republic of Uganda (Swahili : Jamhuri ya Uganda),  is a landlocked country (except for its borders with Lake Victoria and Lake Albert) in East-Central Africa. 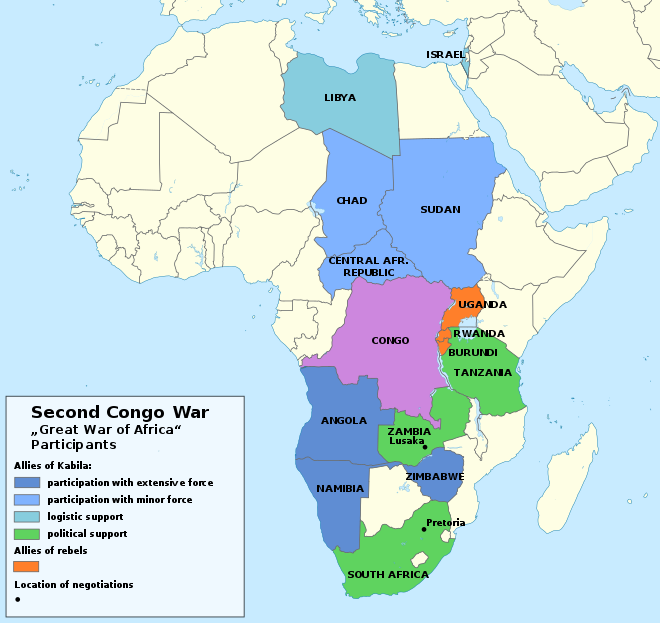 It is bordered to the east by Kenya, to the north by South Sudan, to the west by the Democratic Republic of the Congo, to the south-west by Rwanda, and to the south by Tanzania. The southern part of the country includes a substantial portion of Lake Victoria, shared with Kenya and Tanzania. 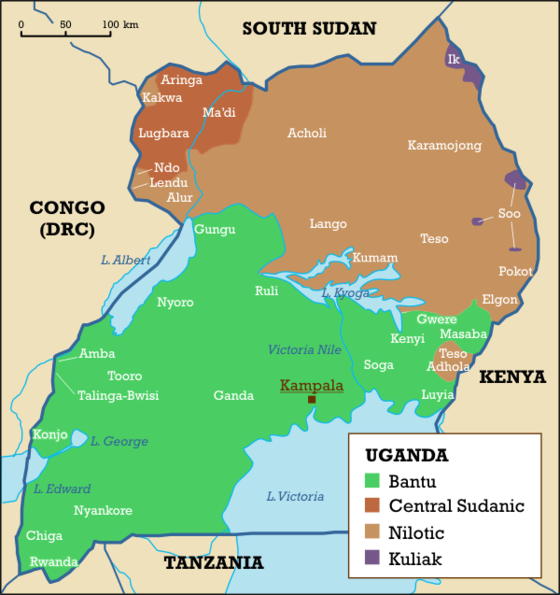 Uganda is in the African Great Lakes region. Uganda also lies within the Nile basin, and has a varied but generally a modified equatorial climate. Swahili, also known as Kiswahili, is a Bantu language and the first language of the Swahili people. It is a lingua franca of the African Great Lakes region and other parts of eastern and south-eastern Africa, including Tanzania, Kenya, Uganda, Rwanda, Burundi, Mozambique, and the Democratic Republic of the Congo (DRC). Comorian, spoken in the Comoros Islands is sometimes considered to be a dialect of Swahili, though other authorities consider it a distinct language. A landlocked state or landlocked country is a sovereign state entirely enclosed by land, or whose only coastlines lie on closed seas. 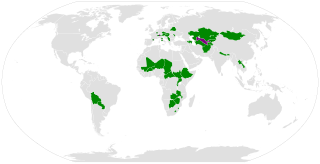 There are currently 49 such countries, including five partially recognised states. Only two, Bolivia and Paraguay in South America, lie outside Afro-Eurasia. A hunter-gatherer is a human living in a society in which most or all food is obtained by foraging. Hunter-gatherer societies stand in contrast to agricultural societies, which rely mainly on domesticated species. Joseph Rao Kony is the leader of the Lord's Resistance Army (LRA), a guerrilla group that formerly operated in Uganda. The official languages are English and Swahili, although "any other language may be used as a medium of instruction in schools or other educational institutions or for legislative, administrative or judicial purposes as may be prescribed by law." Luganda, a central language, is widely spoken across the country, and several other languages are also spoken including Runyoro, Runyankole, Rukiga, Luo  and Lusoga. The Ganda language, or Luganda, is one of the major languages in Uganda and is spoken by more than five million Baganda and other people principally in central Uganda, including the capital Kampala of Uganda. It belongs to the Bantu branch of the Niger–Congo language family. Typologically, it is a highly-agglutinating language with subject–verb–object, word order and nominative–accusative morphosyntactic alignment. 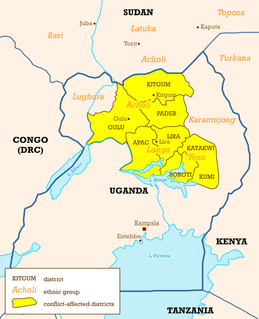 Southern Luo is a dialect cluster of Uganda and neighboring countries. Although Southern Luo dialects are mutually intelligible, there are six ethnically and culturally distinct varieties which are considered to be separate languages socially. The Ugandan Bush War, also known as the Luwero War, the Ugandan civil war or the Resistance War, was a civil war fought in Uganda between the Uganda National Liberation Army (UNLA) and a number of rebel groups, most importantly the National Resistance Army (NRA), from 1980 to 1986. President for life is a title assumed by or granted to some leaders to remove their term limit irrevocably as a way of removing future challenges to their authority and legitimacy. The title sometimes confers on the holder the right to nominate or appoint a successor. The usage of the title of "president for life" rather than a traditionally autocratic title, such as that of a monarch, implies the subversion of liberal democracy by the titleholder. Indeed, sometimes a president for life can proceed to establish a self-proclaimed monarchy, such as Jean-Jacques Dessalines and Henry Christophe in Haiti. The collapse of the UPC-KY alliance openly revealed the dissatisfaction Obote and others had about Buganda's "special status". In 1964 The government responded to demands from some parts of the vast Buganda Kingdom that they were not the Kabaka's subjects. Prior to colonial rule Buganda had been rivalled by the neighbouring Bunyoro kingdom. Buganda had conquered parts of Bunyoro and the British colonialists had formalised this in the Buganda Agreements. Known as the "lost counties", the people in these areas wished to revert to being part of Bunyoro. Obote decided to allow a referendum, which angered the Kabaka and most of the rest of Buganda. The residents of the counties voted to return to Bunyoro despite the Kabaka's attempts to influence the vote. Having lost the referendum, KY opposed the bill to pass the counties to Bunyoro, thus ending the alliance with the UPC. It is true that at the time there was a tendency to see central government and security forces as dominated by "northerners" – particularly the Acholi who through the UPC had significant access to government positions at national level. In northern Uganda there were also varied degrees of anti-Buganda feelings, particularly over the kingdom's "special status" before and after independence, and all the economic and social benefits that came with this status. "Obote brought significant numbers of northerners into the central state, both through the civil service and military, and created a patronage machine in Northern Uganda". However, both "Bantu" and "Nilotic" labels represent significant ambiguities. The Bantu category for example includes both Buganda and Bunyoro – historically bitter rivals. The Nilotic label includes the Lugbara, Acholi and Langi who have bitter rivalries that were to define Uganda's military politics later. Despite these ambiguities, these events unwittingly brought to fore the northerner/southerner political divide which to some extent still influences Ugandan politics. Obote went after KY with a new act of parliament in early 1966 that blocked any attempt by KY to expand outside Buganda. KY appeared to respond in parliament through one of their few remaining MPs, the terminally ill Daudi Ochieng. Ochieng was an irony – although from Northern Uganda, he had risen high in the ranks of KY and become a close confidant to the Kabaka who had gifted him with large land titles in Buganda. In Obote's absence from Parliament, Ochieng laid bare the illegal plundering of ivory and gold from the Congo that had been orchestrated by Obote's army chief of staff, Colonel Idi Amin. He further alleged that Obote, Onama and Neykon had all benefited from the scheme. Parliament overwhelmingly voted in favour of a motion to censure Amin and investigate Obote's involvement. This shook the government and raised tensions in the country. In May 1966, the Kabaka made his move. He asked for foreign help and the Buganda parliament demanded that the Uganda government leave Buganda (including the capital, Kampala). In response Obote ordered Idi Amin to attack the Kabaka's palace. The battle for the Kabaka's palace was fierce – the Kabaka's guards putting up more resistance that had been expected. The British trained Captain – the Kabaka with about 120 armed men kept Idi Amin at bay for twelve hours. It is estimated that up to 2,000 people died in the battle which ended when the army called in heavier guns and overran the palace. The anticipated countryside uprising in Buganda did not materialise and a few hours later a beaming Obote met the press to relish his victory. The Kabaka escaped over the palace walls and was scuttled off into exile in London by supporters. He died there three years later. After a military coup on 25 January 1971, Obote was deposed from power and General Idi Amin seized control of the country. Amin ruled Uganda as dictator with the support of the military for the next eight years. He carried out mass killings within the country to maintain his rule. An estimated 80,000–500,000 Ugandans lost their lives during his regime. Aside from his brutalities, he forcibly removed the entrepreneurial Indian minority from Uganda. In June 1976, Palestinian terrorists hijacked an Air France flight and forced it to land at Entebbe airport. One hundred of the 250 passengers originally on board were held hostage until an Israeli commando raid rescued them ten days later. Amin's reign was ended after the Uganda-Tanzania War in 1979, in which Tanzanian forces aided by Ugandan exiles invaded Uganda. Parliament abolished presidential term limits in 2005, allegedly because Museveni used public funds to pay US$2,000 to each member of parliament who supported the measure. Presidential elections were held in February 2006. Museveni ran against several candidates, the most prominent of them being Kizza Besigye. Uganda has 60 protected areas, including ten national parks: Bwindi Impenetrable National Park and Rwenzori Mountains National Park (both UNESCO World Heritage Sites  ), Kibale National Park, Kidepo Valley National Park, Lake Mburo National Park, Mgahinga Gorilla National Park, Mount Elgon National Park, Murchison Falls National Park, Queen Elizabeth National Park, and Semuliki National Park. Boxing contributes the largest number of Olympic medals for Uganda. The Uganda National Boxing Team is called The Bombers  . The country has an increasingly successful national basketball team. It is nicknamed "The Silverbacks",  and made its debut at the 2015 FIBA Africa Championship. The history of Uganda from 1962 through 1971 comprises the history of Uganda from Ugandan independence from the United Kingdom to the rise of the dictator Idi Amin. The history of Uganda since 11 April 1979 comprises the history of Uganda since the end of the dictatorship of Idi Amin. This period has seen the second rule of Milton Obote and the presidency of Yoweri Museveni since 1986, in which Ugandan politics have been dominated by the National Resistance Movement. The Uganda People's Congress (UPC) is a political party in Uganda. David Oyite Ojok was a Ugandan military commander who held one of the leadership positions in the coalition between Uganda National Liberation Army and Tanzania People's Defence Force which removed strongman Idi Amin in 1979 and, until his death in a helicopter crash, served as the national army chief of staff with the rank of major general. The Constitution of Uganda is the supreme law of Uganda. The fourth and current constitution was promulgated on 8 October 1995. It sanctions a republican form of government with a powerful president. The military history of Uganda begins with actions before the conquest of the country by the British Empire. 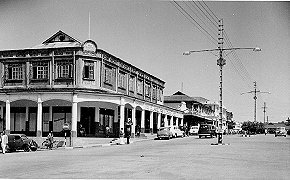 After the British conquered the country, there were various actions, including in 1887, and independence was granted in 1962. After independence, Uganda was plagued with a series of conflicts, most rooted in the problems caused by colonialism. Like many African nations, Uganda endured a series of civil wars and coup d'états. Since the 2000s in particular, the Uganda People's Defence Force has been active in peacekeeping operations for the African Union and the United Nations. The Mengo Crisis, also called the 1966 Buganda Crisis or the 1966 Crisis, domestically, was a period of political turmoil that occurred in Uganda. It was driven by conflict between Prime Minister Milton Obote and the Kabaka of Buganda, Mutesa II, culminating in a military assault upon the latter's residence that drove him into exile. The Ganda people, or Baganda, are a Bantu ethnic group native to Buganda, a subnational kingdom within Uganda. Traditionally composed of 52 tribes, the Baganda are the largest ethnic group in Uganda, comprising 16.9 percent of the population. Samuel Ngude Odaka was a Ugandan diplomat, politician and member of the Uganda People's Congress political party. He served as the Foreign Minister of Uganda from 1964 to 1971 during the first tenure of President Milton Obote. He later became the Minister of Planning and Economic Development during the second Obote administration (1980–1985). Kirya Balaki Kebba the ex-Rebel Leader now-defunct rebel Uganda Freedom Movement who was kidnapped by security agents from Jamuhuri estate in Nairobi while in Exile in the Republic of Kenya and brought back to Uganda. Kirya Balaki Kebba was acquitted of Treason charges in 1983 but was detained. Daudi Ochieng was a Ugandan politician, who served as secretary general of the Kabaka Yekka (KY) party and Opposition Chief Whip. 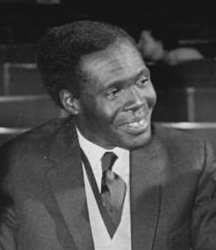 In 1965–6, his allegations – crystallised in a motion he put before Parliament on 4 February 1966 – that then-Prime Minister Milton Obote and deputy commander of the Ugandan army Idi Amin had been complicit in the looting and misappropriation of gold, ivory and cash by Congolese rebels precipitated the Gold Scandal. The lost counties referendum of November 1964 was a local referendum held to decide whether the "lost counties" of Buyaga and Bugangaizi in Uganda should continue to be part of the Kingdom of Buganda, be transferred back to the Kingdom of Bunyoro, or be established as a separate district. The electorate, consisting of the residents of the two counties at the time of independence, voted overwhelmingly to be returned to Bunyoro. Grace Stuart Katebariirwe Ibingira was a Ugandan politician and statesman. 1 2 3 "The Constitution (Amendment) Act 2005" (PDF). Retrieved 17 January 2017. 1 2 3 4 5 6 7 Central Intelligence Agency (2009). "Uganda". The World Factbook . Retrieved 23 January 2010. ↑ "Republic of Uganda – Census 2014 – Final Report – Table 2.1 page 8" (PDF). 1 2 3 4 "Uganda". International Monetary Fund. Retrieved 17 January 2017. ↑ "Gini index (World Bank estimate)". World Bank. Retrieved 17 January 2017. ↑ "Who is Joseph Kony? A look at the Ugandan warlord | Toronto Star". thestar.com. Retrieved 9 December 2016. ↑ "Article 6, Chapter 2, Constitution of the Republic of Uganda, 1995". ↑ "East Africa Living Encyclopedia – Ethnic Groups". African Studies Center, University of Pennsylvania. ↑ Mwakikagile, Godfrey (2009). Ethnicity and National Identity in Uganda: The Land and Its People. New Africa Press. p. 87. ↑ Mwambutsya, Ndebesa (June 1990 – January 1991). "Pre-capitalist Social Formation: The Case of the Banyankole of Southwestern Uganda". Eastern Africa Social Science Research Review. 6 (2, 7 no. 1): 78–95. Archived from the original on 31 January 2008. ↑ ""Origins of Bunyoro-Kitara Kings"". Archived from the original on 10 December 2006. Retrieved 10 December 2006. , bunyoro-kitara.com. 1 2 "Background Note: Uganda". Bureau of African Affairs, United States Department of State. November 2008. Retrieved 21 January 2017. 1 2 Pulford, Cedric (2011). Two Kingdoms of Uganda: Snakes and Ladders in the Scramble for Africa. Daventry: Ituri Publications. ↑ Beachey, R. W. (1962). "The Arms Trade in East Africa in the Late Nineteenth Century". The Journal of African History: 451. doi:10.1017/s0021853700003352. ↑ J. H. Kennaway (6 February 1893). "House of Commons: Address In Answer To Her Majesty's Most Gracious Speech – Adjourned Debate". Commons and Lords Hansard. Retrieved 17 January 2017. ↑ Evans, Ruth (24 May 2000). "Kenya's Asian heritage on display". BBC . Retrieved 18 January 2017. ↑ Chao (26 October 2014). "THE LUNATIC EXPRESS – A PHOTO ESSAY ON THE UGANDA RAILWAY". Thee Agora. Archived from the original on 22 April 2016. Retrieved 18 January 2017. ↑ West, Stewart (February 2012). "Policing, Colonial Life and Decolonisation in Uganda, 1957–1960" (PDF). The Ferguson Centre for African and Asian Studies, Working Paper No. 03. pp. 3–4. Archived from the original (PDF) on 2015-09-30. ↑ Fèvre, E. M.; Coleman, P. G.; Welburn, S. C.; Maudlin, I. (April 2004). "Reanalyzing the 1900–1920 Sleeping Sickness Epidemic in Uganda" (PDF). Emerging Infectious Diseases. US: Centers for Disease Control and Prevention. Retrieved 18 January 2017. ↑ "Buganda Kingdom: The Uganda Crisis, 1966". Buganda.com. Retrieved 3 May 2010. ↑ Lee, J. M. (January 1964). "Uganda's first year of Independence". The Political Quarterly. 35 (1): 35–45. doi:10.1111/j.1467-923X.1964.tb01966.x. ↑ Young, Crawford (1979). The politics of cultural pluralism. Madison: University of Wisconsin Press. pp. 248–250. ISBN 9780299067441. ↑ Mutibwa, Phares (1992). Uganda since independence, a story of unfulfilled hopes. London: Hurst. ISBN 9781850650669. ↑ Kasozi, A. B. K. (1994). The social origins of violence in Uganda, 1964–1985. Montreal: McGill-Queens's University Press. ISBN 9780773512184. ↑ Bade, Albert (1996). Benedicto Kiwanuka : the man and his politics. Kampala: Fountain Publ. ISBN 978-9970020089. ↑ Ciment, James (2006). Encyclopedia of conflicts since World War II (2nd ed.). London: Routledge. p. 311. ISBN 9780765680051. 1 2 Kasozi (1994). The social origins of violence in Uganda, 1964–1985. p. 63. ↑ Kasozi (1994). The social origins of violence in Uganda, 1964–1985. p. 71. ↑ Kasozi (1994). The social origins of violence in Uganda, 1964–1985. p. 70. ↑ Lamwaka, Caroline (2016). The Raging Storm: A Reporter's Inside Account of the Northern Uganda War, 1986–2005. Kampala: Fountain Publishers. ISBN 978-9970252213. 1 2 Otunnu, Ogenga (2016). Crisis of Legitimacy and Political Violence in Uganda, 1890 to 1979. London: Palgrave Macmillan. ISBN 978-3319331553. ↑ Kasozi (1994). The social origins of violence in Uganda, 1964–1985. p. 83. 1 2 Allen, Tim; Vlassenroot, Koen (2010). The Lord's Resistance Army: myth and reality. London: Zed. ISBN 9781848135635. ↑ Somerville, Keith (2017). Ivory: Power and Poaching in Africa. London: Hurst. ISBN 9781849046763. ↑ Kasozi (1994). The social origins of violence in Uganda, 1964–1985. p. 64. ↑ Kasozi (1994). The social origins of violence in Uganda, 1964–1985. p. 85. ↑ Keatley, Patrick (18 August 2003). "Obituary: Idi Amin". The Guardian. Retrieved 18 March 2008. ↑ "UK Indians taking care of business", The Age (8 March 2006). Retrieved 24 March 2013. ↑ "1976: Israelis rescue Entebbe hostages". BBC News. 4 July 1976. Archived from the original on 27 December 2012. Retrieved 27 December 2012. ↑ "No End to LRA Killings and Abductions". Human Rights Watch. 23 May 2011. ↑ "Uganda 2011 Elections" (PDF). European Union Election Observation Mission. 20 February 2011. ↑ Article 19. (2013). Uganda: Public Order Management Bill. ↑ Masereka, Alex. (2013). M7 Okays Public Order Bill. Red Pepper. 1 2 3 United States Department of State (Bureau of Democracy, Human Rights and Labor). (2012). Uganda 2012 Human Rights Report. ↑ Natabaalo, Grace. (2013). Ugandan Police Shutdown Papers Over 'Plot'. Al Jazeera. ↑ Maxwell, Daniel, and Ben Watkins. "Humanitarian information systems and emergencies in the Greater Horn of Africa: logical components and logical linkages." Disasters 27.1 (2003): 72-90. 1 2 3 "Maps". Data Basin. ↑ "World Heritage List" . Retrieved 4 June 2013. ↑ "Corruption Perceptions Index 2016". Transparency International. Retrieved 17 April 2017. ↑ "Piglets released in Ugandan parliament investigated for terrorism". Uganda News.Net. Archived from the original on 11 October 2014. Retrieved 23 June 2014. ↑ Human Rights Watch. (2013). Letting the Big Fish Swim. ↑ "A Snapshot of Corruption in Uganda". Business Anti-Corruption Portal. Retrieved 24 March 2014. ↑ The International Center for Not-For-Profit Law. (2012). NGO Law Monitor: Uganda. 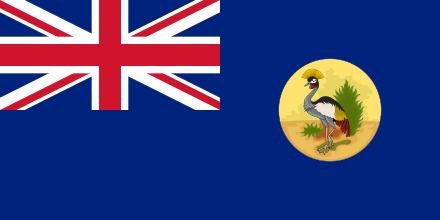 ↑ "UG – Uganda". ISO 3166 . ISO. 23 November 2017. Retrieved 1 December 2017. ↑ "Ministry of Local Government Fact Sheet" (PDF). MOLG. 1 July 2017. Retrieved 1 December 2017. ↑ Public Accountability: Explaining Variation Across Local Governments in Uganda (MPhil thesis). University of Bergen. 2013. p. 4. Retrieved 1 December 2017. ↑ Uganda Local Government Association. Ulga.org. Retrieved on 19 July 2013. ↑ Tumushabe, Alfred (22 September 2012) Ankole monarchists' two decade battle for restoration of kingdom. monitor.co.ug. ↑ "A rough guide to the country's kingdoms". 11 September 2009. ↑ "With Somalia, CAR, and South Sudan, Museveni is remaking the state – Charles Onyango Obbo". Monitor.co.ug. Retrieved 30 May 2015. ↑ "AFP: Attacks of 'appalling brutality' in DR Congo: UN". Google. 10 February 2009. Archived from the original on 25 May 2012. Retrieved 29 July 2009. 1 2 3 4 5 Refworld |2010 Findings on the Worst Forms of Child Labor – Uganda [ permanent dead link ]. UNHCR (3 October 2011). Retrieved 24 March 2013. ↑ "World Refugee Survey 2008". U.S. Committee for Refugees and Immigrants. 19 June 2008. Archived from the original on 26 February 2009. ↑ Human Rights Watch. (2013). World Report 2013 (Uganda). ↑ ""Lesbian, gay, bisexual and transgender people"". Archived from the original on 11 March 2008. Retrieved 27 January 2011. CS1 maint: BOT: original-url status unknown (link), Amnesty International Report 2007 Uganda. ↑ "Ugandan paper calls for gay people to be hanged", Xan Rice, The Guardian , 21 October 2010. ↑ "Ugandan gay rights activist: 'I have to watch my back more than ever'", 5 November 2010. ↑ "Uganda: Stop homophobic campaign launched by Rolling Stone tabloid", 14 October 2010, No Peace Without Justice. ↑ "Uganda Newspaper Published Names/Photos of LGBT Activists and HRDs – Cover Says 'Hang Them'" Archived 1 February 2011 at the Wayback Machine , International Lesbian, Gay, Bisexual, Trans and Intersex Association. ↑ Akam, Simon (22 October 2010), "Outcry as Ugandan paper names 'top homosexuals'", The Independent . 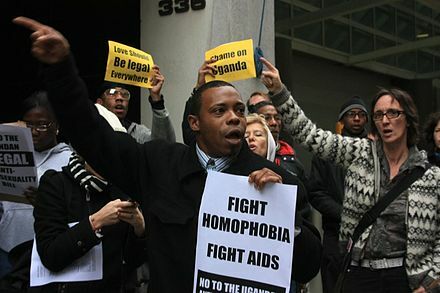 ↑ "Uganda gay rights activist David Kato killed", 27 January 2011, BBC News. ↑ Sharlet, Jeff (September 2010). "Straight Man's Burden: The American roots of Uganda's anti-gay persecutions". Harper's Magazine. 321 (1, 924): 36–48. Retrieved 21 January 2011. ↑ Brocklebank, Christopher (15 August 2012). Anonymous hack into Ugandan government websites in protest at their anti-LGBT policies. Pinknews.co.uk. 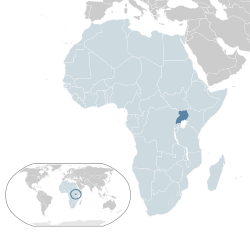 ↑ "Uganda's anti-gay law prompts World Bank to postpone $90mn loan" Archived 29 October 2014 at the Wayback Machine , Uganda News.Net, 28 February 2014. ↑ "Uganda anti-gay law challenged in court". The Guardian. AFP. 31 July 2014. Retrieved 1 August 2014. ↑ "Uganda court annuls anti-gay law". BBC News. 1 August 2014. Retrieved 1 August 2014. ↑ "Uganda constitutional court annuls new anti-gay law". Times LIVE. AFP. 1 August 2014. Retrieved 1 August 2014. ↑ "Section 4(2) of The Bank of Uganda Act" (PDF). Bank of Uganda. 2000. Retrieved 17 January 2017. ↑ "2015 Statistical Abstract – Table 3.3a: Exports of merchandise (Flows) – CY" (PDF). Research and Policy Directorate, Bank of Uganda. p. 9. Retrieved 17 January 2017. ↑ "Monetary Policy Report" (PDF). Bank of Uganda. August 2016. Retrieved 17 January 2017. 1 2 Uganda's oil rush: Derricks in the darkness. Economist.com (6 August 2009). Retrieved 24 March 2013. ↑ "Uganda at a Glance" (PDF). World Bank. 13 November 2009. Archived from the original (PDF) on 23 December 2009. ↑ "Economic Policy and Debt – Heavily Indebted Poor Countries (39 countries)". 1 2 3 "Economic growth and the MDGs – Resources – Overseas Development Institute". ODI. Retrieved 31 May 2011. ↑ "List of Licensed Investment Banks & Stock Brokerage Firms in Uganda". Use.or.ug. 31 December 2001. Archived from the original on 23 April 2014. Retrieved 27 June 2012. ↑ Kaujju, Peter (June 2008). "Capital markets eye pension reform Archived 11 May 2011 at the Wayback Machine ". The New Vision. Retrieved 9 February 2009. ↑ Rutaagi, Edgar (2009). "Uganda Moving Towards Pension Reforms Archived 7 July 2011 at the Wayback Machine ". The African Executive. Retrieved 9 February 2009. ↑ Mbunga, Paskal. "Tanzania And Uganda Agree To Speed Up Railway Project". Businessdailyafrica.com8 November 2011. Retrieved 27 June 2012. ↑ "Annual Remittances Data". World Bank. Archived from the original on 5 January 2017. Retrieved 17 January 2017. ↑ Ondoga, Ayiga (June 2008). "Arua: West Nile's business hub Archived 8 July 2012 at Archive.today ". The New Vision. ↑ Yoshino, Yutaka; Ngungi, Grace and Asebe, Ephrem. ""Enhancing the Recent Growth of Cross-Border Trade between South Sudan and Uganda", Africa Trade Policy Notes. ↑ Muwanga, David (March 2010), "Uganda, Rwanda Border to Run 24hrs". AllAfrica.com. ↑ "November inflation increases to 4.6%". ↑ "Uganda sees drop in inflation in 2017/18 financial year - Xinhua - English.news.cn". www.xinhuanet.com. ↑ "Poverty headcount ratio at $1.25 a day (PPP) (% of population)". World Bank. Retrieved 26 August 2015. ↑ "Enabling Poor People to Overcome Poverty in Uganda" (PDF). International Fund for Agricultural Development. Archived from the original (PDF) on 24 September 2015. Retrieved 26 August 2015. ↑ "IFAD Gender Strengthening Programme" (PDF). International Fund for Agricultural Development. Archived from the original (PDF) on 3 December 2011. Retrieved 10 February 2012. ↑ "From Periphery to Center: A Strategic Country Gender Assessment" (PDF). World Bank. Retrieved 10 February 2012. ↑ "AVERTing HIV and AIDS". AVERT. Retrieved 10 February 2012. ↑ Ekirapa-Kiracho, E. (2011). "Increasing Access To Institutional Deliveries Using Demand And Supply Side Incentives: Early Results From A Quasi-Experimental Study". BMC International Health and Human Rights. 11 (Suppl 1): S11. doi:10.1186/1472-698x-11-s1-s11. PMC 3059470 . PMID 21410998 . Retrieved 26 May 2012. ↑ Peters, David; et al. (2011). "Exploring New Health Markets: Experiences From Informal Providers Of Transport For Maternal Health Services In Eastern Uganda". BMC International Health and Human Rights. 11 (Suppl 1): S10. doi:10.1186/1472-698x-11-s1-s10 . Retrieved 26 May 2012. ↑ "Gender Equity Issues in Uganda". Foundation for Sustainable Development. Retrieved 10 February 2012. 1 2 3 "Q1-Market Report 2015" (PDF). Reports & Surveys. UCC: Uganda Communications Commission. Retrieved 15 February 2015. ↑ "National Population and Housing Census 2014" (PDF). Uganda Bureau of Statistics. ↑ Hendrik Rood; Senior consultant; Stratix Consulting. "Uganda – Mobile Market – Insights, Statistics and Forecasts – BuddeComm – BuddeComm". Budde.com.au. Retrieved 30 May 2015. ↑ Heritage Oil |Timeline. Heritageoilplc.com. Retrieved 24 March 2013. ↑ Mugisha, Silver; Berg, Sanford V. (November 2006). "Struggling State-Owned Enterprises: NWSC's Turnaround in Uganda". SSRN 1088139 . ↑ UN-Water; World Water Assessment Programme (2006). "National Water Development Report: Uganda. Prepared for 2nd UN World Water Development Report "Water, a shared responsibility"" (PDF). Retrieved 2008-05-05. ↑ Ministry of Water and Environment (2011). "Third Water and Environment Sector Performance Report" . Retrieved 16 July 2012. World Health Organization; UNICEF. "Joint Monitoring Program". Archived from the original on 16 February 2008. Retrieved 16 July 2012. 1 2 Republic of Uganda; Ministry of Finance; Planning and Economic Development. "Poverty Eradication Action Plan (2004/5-2007/8)" (PDF). Archived from the original (PDF) on 10 October 2008. Retrieved 7 May 2008. ↑ Ministry of Water and Environment (Uganda) (September 2006). "Water and Sanitation Sector Performance Report 2006" (PDF). Archived from the original (PDF) on 2009-03-18. Retrieved 13 May 2008. 1 2 3 "Human Development Report 2009 – Uganda [Archived]". Hdrstats.undp.org. Archived from the original on 29 April 2009. Retrieved 3 May 2010. ↑ Dugger, Celia (29 July 2011). "Maternal Deaths Focus Harsh Light on Uganda". The New York Times. Retrieved 17 January 2012. ↑ Rutebemberwa, E.; Ekirapa-Kiracho, E.; Okui, O.; Walker, D.; Mutebi, A.; Pariyo, G. (2009). "Lack of effective communication between communities and hospitals in Uganda: A qualitative exploration of missing links". BMC Health Services Research. 9: 146. doi:10.1186/1472-6963-9-146. PMC 2731748 . PMID 19671198. ↑ Kiguli, Julie; et al. (2009). "Increasing access to quality health care for the poor: community perceptions on quality care in Uganda". Patient Preference and Adherence. 3. Retrieved 26 May 2012. 1 2 Pariyo, G.; et al. (2009). "Changes in Utilization of Health Services among Poor and Rural Residents in Uganda: Are Reforms Benefitting the Poor?". International Journal for Equity in Health. Retrieved 26 May 2012. ↑ "Ebola Outbreak Spreads". Daily Express. Associated Press. 31 July 2012. ↑ Biryabarema, Elias (5 October 2012). "Uganda says it is now free of deadly Ebola virus". Reuters. ↑ "Three die in Uganda from Ebola-like fever: Health Ministry". Yahoo News. Retrieved 16 August 2013. ↑ Kelly, Annie (1 December 2008), "Background: HIV/Aids in Uganda". The Guardian. ↑ "UNAIDS: Uganda Profile". UNAIDS. ↑ Kamali, A.; Carpenter, L. M.; Whitworth, J. A.; Pool, R.; Ruberantwari, A.; Ojwiya, A. (2000). "Seven-year trends in HIV-1 infection rates, and changes in sexual behaviour, among adults in rural Uganda". AIDS. 14 (4): 427–434. doi:10.1097/00002030-200003100-00017. PMID 10770546. 1 2 "Contraception and Unintended Pregnancy in Uganda". Guttmacher Institute. 2016-02-14. Retrieved 2019-01-30. ↑ "Uganda Demographic and Health Survey 2006" (PDF). Measure DHS. Retrieved 17 January 2012. 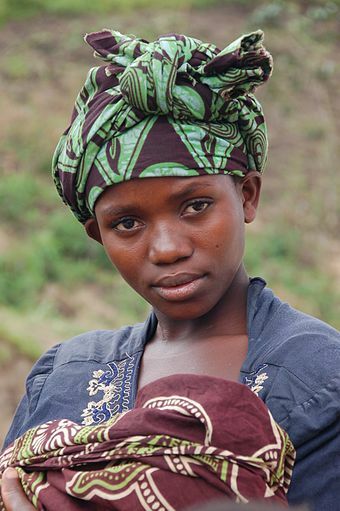 ↑ "Improving Access to Safe Deliveries in Uganda". Future Health Systems. Retrieved 17 January 2012. ↑ "Women's Perceptions of ANC and delivery care Services, a community perspective" (PDF). Future Health Systems. Archived from the original (PDF) on 14 November 2012. Retrieved 8 May 2012. ↑ "Uganda bans female genital mutilation". BBC News. 2009-12-10. Retrieved 30 May 2015. ↑ ADF recruiting in Mayuge, Iganga says army. Newvision.co.ug (3 January 2013). Retrieved 24 March 2013. 1 2 UNESCO Science Report: towards 2030 (PDF). Paris: UNESCO. 2015. pp. 471–565. ISBN 978-92-3-100129-1. ↑ Uganda Bureau Of Statistics (UBOS) (November 2015). National Population and Housing Census 2014. Provisional Results (PDF) (Revised ed.). Kampala, Uganda. p. 6. Retrieved 29 March 2015. 1 2 "Uganda Comprehensive Refugee Response Portal". Operational Data Portal. UNHCR. Retrieved 22 November 2018. 1 2 3 4 "2014 Uganda Population and Housing Census – Main Report" (PDF). Uganda Bureau of Statistics. Retrieved 17 April 2018. ↑ "2002 Uganda Population and Housing Census – Main Report" (PDF). Uganda Bureau of Statistics. Retrieved 26 March 2008. ↑ Lorch, Donatella (22 March 1993). "Kampala Journal; Cast Out Once, Asians Return: Uganda Is Home". The New York Times. Retrieved 29 September 2011. ↑ "Bombers finally begin 2018 Commonwealth Games training". Daily Monitor. Retrieved 2019-01-06. ↑ Kaweru, Franklin, "Uganda's Silverbacks ranked 89th in latest FIBA rankings" Archived 12 October 2015 at the Wayback Machine , KAWOWO Sports, 9 October 2015. Retrieved 26 October 2015. ↑ Adeyemi, Bandele (19 August 2011). "Frustrating View of Game Day". The New York Times. Retrieved 29 September 2011. ↑ "Major League Baseball seeks its next top players in the sport's 'next frontier': Africa" – via The Globe and Mail. 1 2 3 Telling the story against all odds; state of Uganda film industry. Cannes vu par. Retrieved on 19 July 2013. 1 2 3 Ugandan film's leap – Theatre & Cinema. monitor.co.ug. Retrieved on 19 July 2013. "Uganda". The World Factbook . Central Intelligence Agency.